Most melodies you'll hear, whether instrumental or vocal, will combine scale movements and arpeggios. By inserting arpeggios into your regular scale phrases, you can turn those aimless scale meanderings into more meaningful melodic statements. The easiest way to accomplish this is to visualise arpeggios within those familiar scale patterns you learn. That way, you can give your solos a fluid and dynamic mixture of horizontal and vertical movement. Take a look at the presentation below for the basic concept, and then use the following supplementary content to really cement this knowledge in your mind. 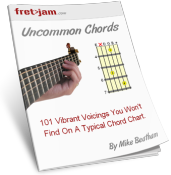 Where there's a chord, there's an arpeggio (and vice versa)! For example, the major scale (and major pentatonic) contains the tones 1 3 5 - a major triad. This can function as a major arpeggio. The natural minor scale (and minor pentatonic) contains the tones 1 ♭3 5 - a minor triad. This can function as a minor arpeggio. The general concept is to combine regular scale movements (horizontal melody) with arpeggios (vertical melody). Moving around the scale like this will keep it connected to the backing chords. It's an easy way of keeping your solos sounding natural and melodic. Most popular major key songs use chords that can be pulled from the major scale. When we harmonise the major scale on each of its degrees (1 - 7), we get seven chords. This means we can pull seven related arpeggios from a given major scale pattern. When the chord changes, we change which arpeggio we use from the scale. We just have to learn to correspond the chord changes with the correct arpeggios. This is a great way of connecting your solo to the chord changes. Starting with the I or tonic chord, we have a major arpeggio (1 3 5) that we can visualise within a major scale pattern. Below, I'm using a two-position pattern that will allow us to span a good neck range. Start by positioning the root (1) on A (so, A major - the key of the backing tracks below) and later you can test your knowledge in other keys/positions. Oops. Your browser doesn't support native audio. Download it here instead. We'll leave out the 7th chord for now (diminished), because it's rarely used. Once you're comfortable with playing through two-chord changes like in the above tracks, test your skills using faster, more complex tracks, such as this rock backing tracks compilation. Sometimes we might use a single scale over a single chord. The same concept applies to visualising the related arpeggio within that scale and using it as the "skeleton" structure of your melody. So you can see how learning these arpeggio patterns in the context of the scales you play can help to structure the phrasing around that scale. You can also embellish these arpeggios to include additional tones from the related scale, including 7th arpeggios. Try starting on different tones of the arpeggio - e.g. 1 3 5, 3 5 1, 5 1 3. Instead of a straight 1 3 5 sequence, try a staggered 3 1 3 5 3 5... and then move into your scale phrase. Place the arpeggio at the start, end and/or in the middle of your scale phrases. Learn about the different techniques you can use to play arpeggios, from legato to sweep picking. The general idea is to inject these vertical melodic passages into your scale phrases, whether as lead-ins, lead-outs or as bridges between phrases and licks (these three methods were covered in the video). Keep experimenting with adding arpeggios to your lead lines and wrapping scale phrases around arpeggios in different ways. Once you can play through the chord tracks from this lesson, try testing your knowledge over some simple three and four chord backing tracks.